High Renaissance Painter and Architect. 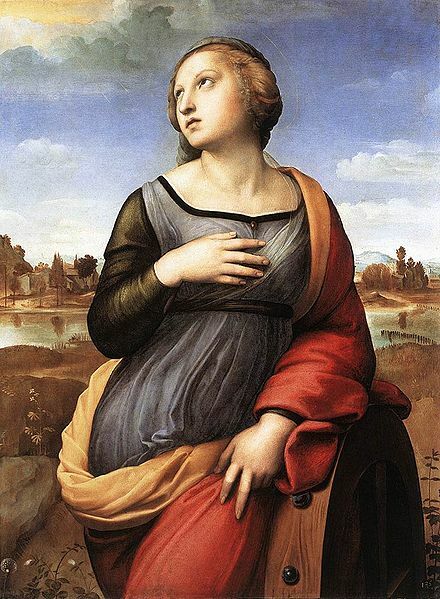 Raphael Sanzio was born in 1483 in the province of Umbria and received provincial training in the workshop of Pietro Perugino. 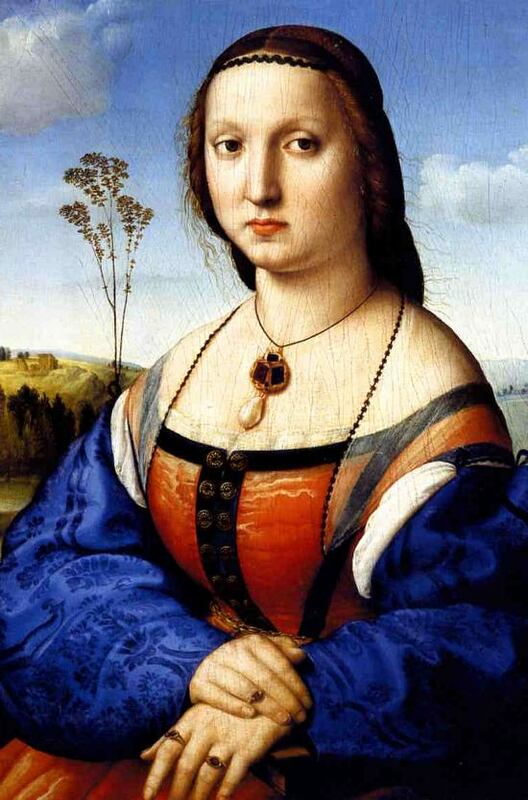 At the age of seventeen, he proved himself to be one of the most promising of the younger painters but was still much influenced by Perugino's work. 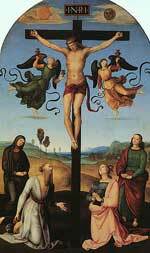 This can be seen in his early painting "Assumption and Coronation of the Virgin" and in "The Crucifixion" now in the National Gallery, London. Both of these paintings were completed when the artist was about twenty. 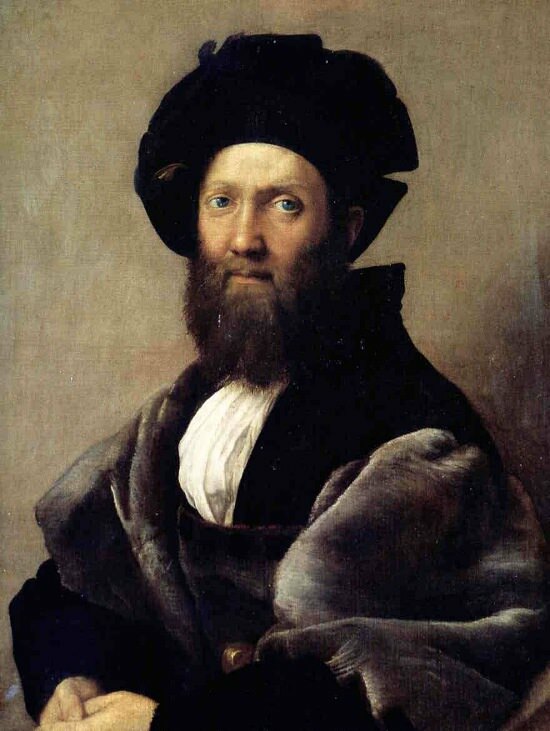 This is a condensed account of the artist's life, to read the full version go to Raphael's Biography. Arriving in Florence the young artist soon realised the limitations of his apprenticeship in Umbria. He was faced with the daunting challenge presented by the work of Leonardo and Michelangelo and set out to study and learn from their paintings and sculptures. 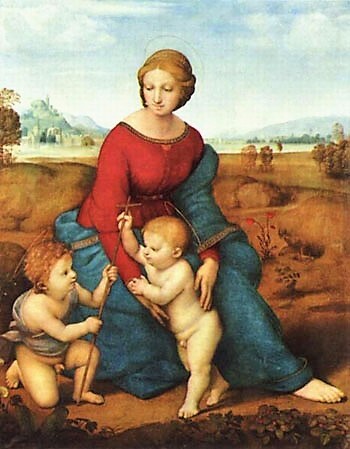 Raphael lacked the depth of knowledge of a Leonardo and could not match Michelangelo's power, he was a likeable and even-tempered artist, virtues that made him a favourite with potential patrons. His two great predecessors and rivals could both be difficult to get on with and proved to be unpredictable when carrying out their commissions, and so the young artist was able to compete despite the reputations of the two great masters. 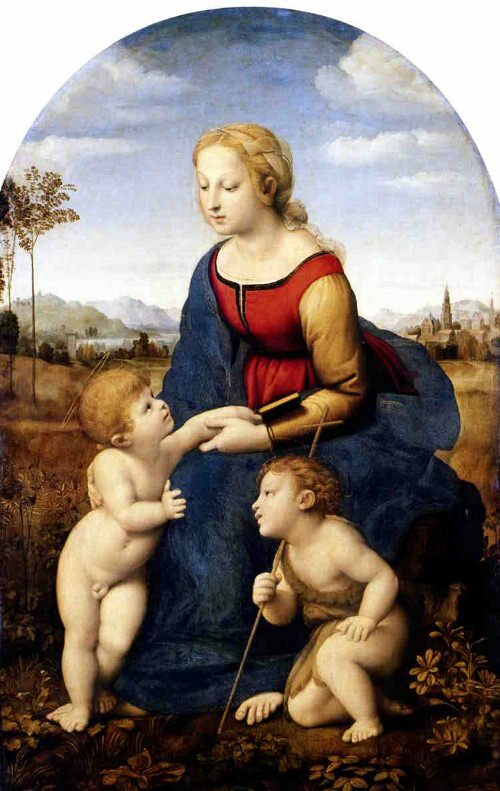 At this time the artist was also influenced by the painter Fra Bartolomeo from Tuscany and the two remained on friendly terms, but the influence of Leonardo was apparent in "The Madonna of the Meadow" 1506. 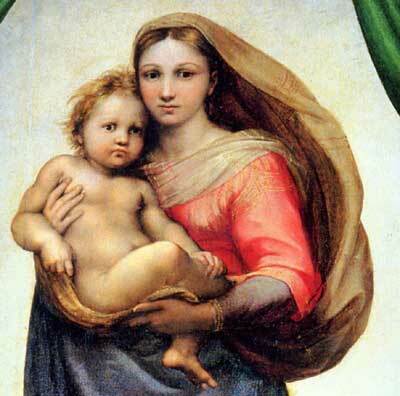 The artist is noted for his many images of the Madonna. 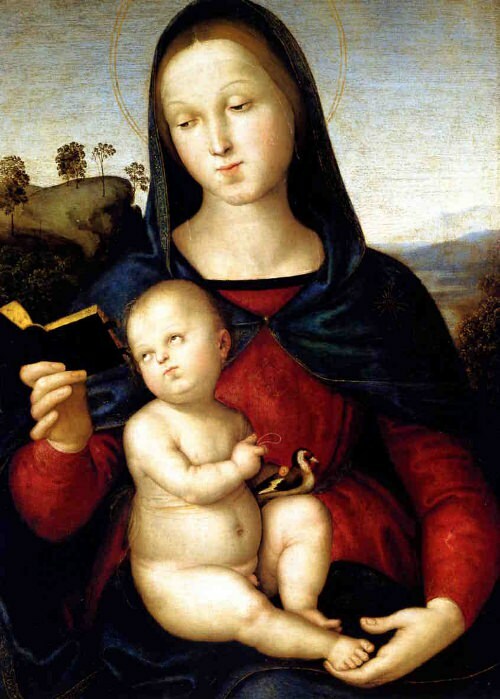 The message of purity that the Madonna symbolises is an important one for Christians and the wealthy and important private clients of the Renaissance demanded pictures of the Virgin for their private devotion, a demand that Raphael was eager to satisfy. 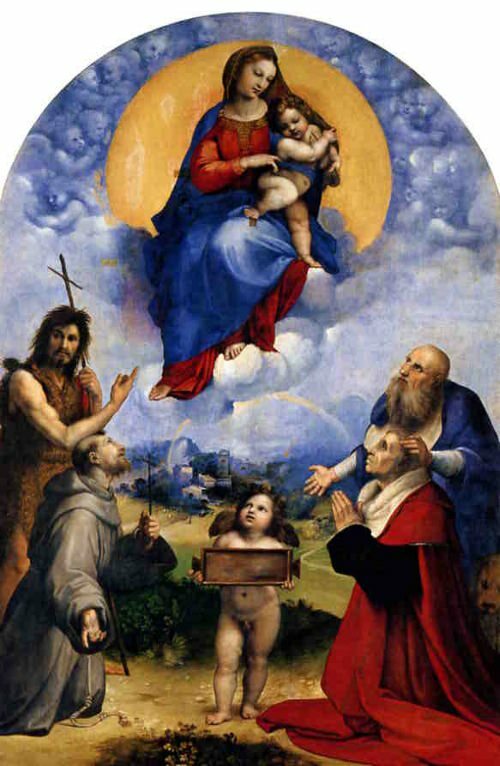 The Madonna was a subject that stayed with him throughout his short life, it is remarkable that he was able to offer such diversity, without repetition, in his depictions of the Holy Mother. 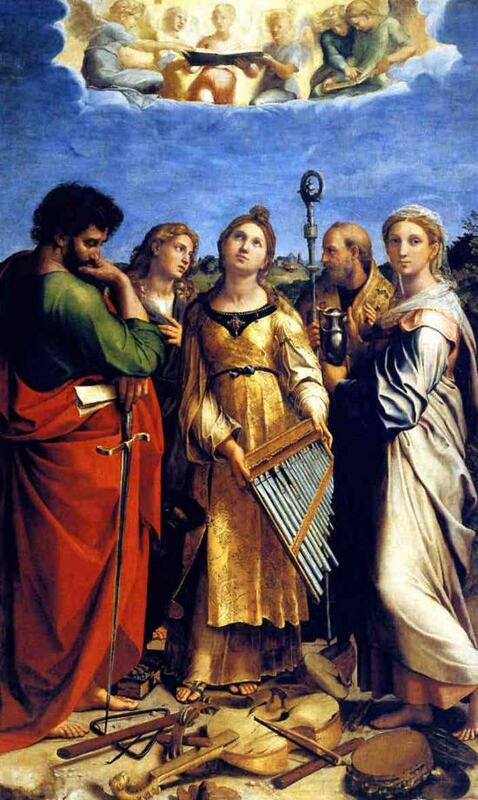 Raphael arrived in Rome in 1508 and Pope Julius II soon found work for the young artist. He was asked to decorate the Pope's private library in a selection of rooms known as the Stanze. 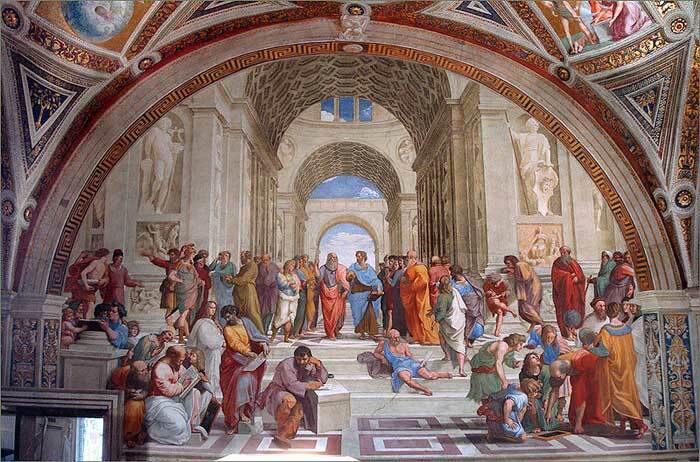 The paintings include "The School of Athens", "Disputation of the Sacrament" and "Parnassus", all housed in the signature room. These remain among the most famous images produced by the painter. 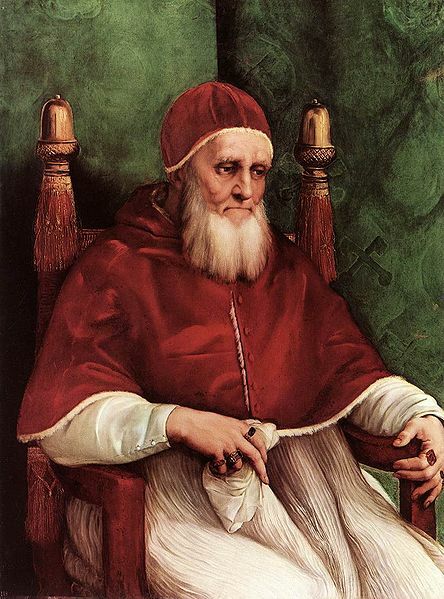 Pope Leo X succeeded Julius II on his death, he was a member of the Medici family and continued to act as patron to the artist who painted the Pope's portrait in 1518. The famous artist was much in demand as a portrait painter. 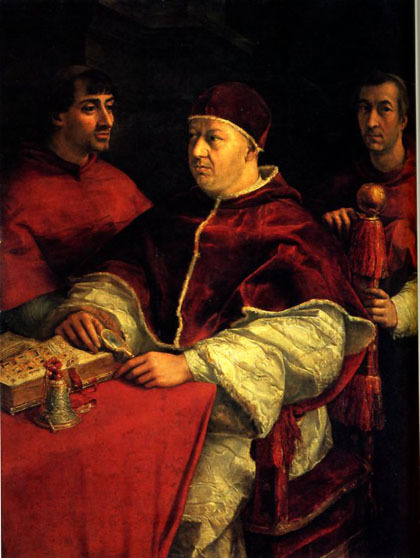 He depicted the popes and the wealthy noblemen and women of the time with incredible skill his likenesses give life and personality to his sitters despite his adherence to the standard protocols demanded by his patrons. 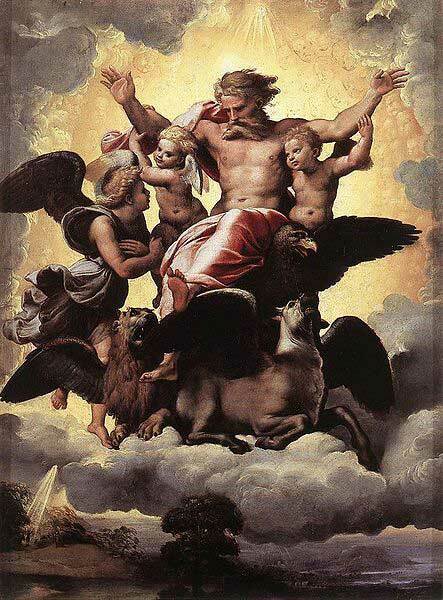 The Vision of Ezekiel 1518. Oil on Panel, Palazzo Pitti, Florence. 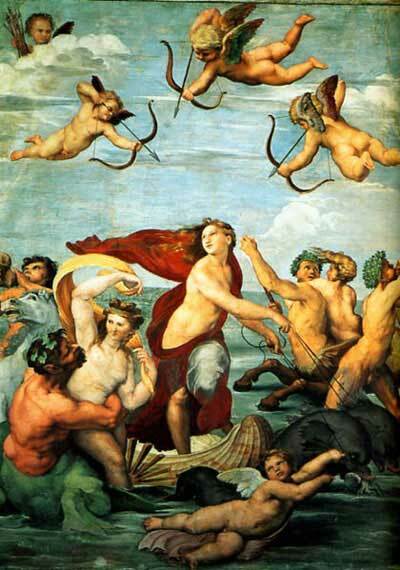 Galatea was painted for the merchant and banker Agosto Chigi who possibly the most wealthy man in Rome at the time that the painting was commissioned. The work was placed in Chigi's villa on the banks of the Tiber (now named the Villa Farnesina) and was intended to highlight Chigi's position as a major patron of the arts. In 1514 the artist was named architect of St Peter's and for a while was the most important architect in Rome. He designed several buildings including the Chigi Chapel in the Church of Santa Maria del Popolo, but his work on St Peter's was demolished when Michelangelo's design became accepted. 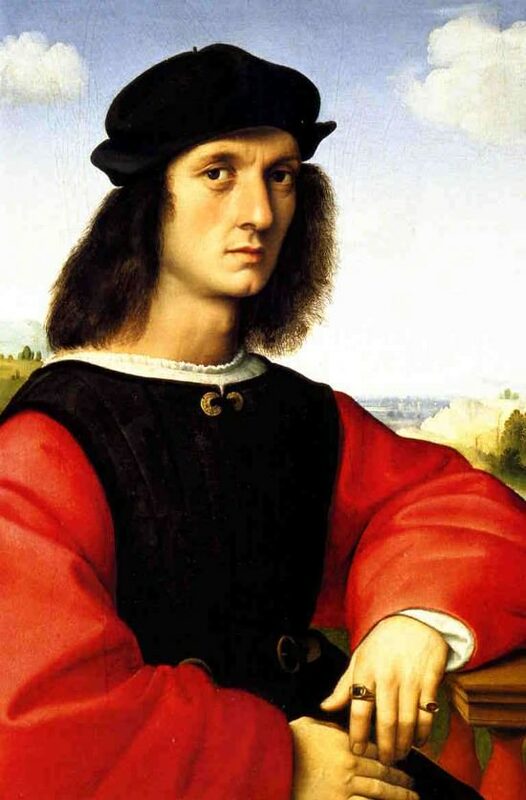 Raphael died on April 6th 1520 at the age of 37 and, such was his fame, that the leading scholar of the age, Cardinal Bembo, wrote the epitaph for his tomb. 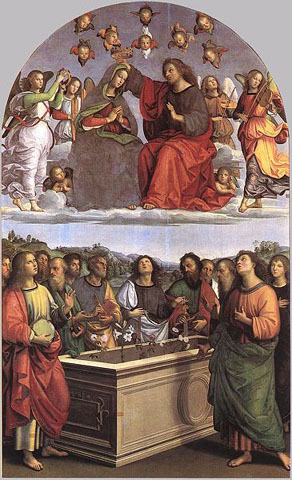 This is Raphael's tomb, while he lived he made Mother Nature fear to be vanquished by him and, as he died, to die too.